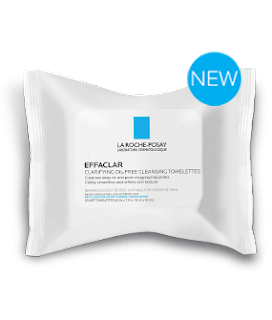 These new cleansing towelettes from La Roche-Posay, EFFACLAR Clarifying Oil-Free Cleansing Towelettes, cleanse away oil and pore clogging impurities, down to microscopic pollution particles. They are formulated with micro-exfoliating Lipo-Hydroxy Acid and oil-targeting Zinc Pidolate. Use daily as a daily cleanser for oily skin. These help visibly tighten pores and refine skin texture. They have a refreshing, no-rinse formula. EFFACLAR Cleansing Towelettes facial wipes have been developed with a dermatologist to remove oil and pore clogging impurities, down to microscopic pollution particles , while being gentle and safe for sensitive skin. Dermatologist tested to be safe for sensitive skin, the towelettes are alcohol-free, paraben-free, fragrance-free, and sulfate-free. The 2-in-1 towelettes go beyond gentle cleansing to also refine skin texture and the pre-moistened towelettes make sticking to a routine simple. These are formulated to offer effective cleansing and skincare benefits that won't irritate skin. They have soothing anti-oxidant La Roche-Posay Thermal Spring Water in them and Zinc Pidolate with mild cleansing agents to purify skin. The Lipo-Hydroxy acid is mildly exfoliating but is not irritating to the skin. Use the towelettes in the morning and in the evening. Gently wipe our face with the facial wipes to remove dirt and oil. Do not rinse face. Dispose of facial wipes after use. Avoid the eye area. In case of contact with eyes, rinse eyes with water. These are recommended for oily skin and aging dull complexions. They have been Dermatologist tested. They are oil-free, paraben-free, alcohol-free and fragrance-free. The towelettes are safe enough for even the most sensitive skins. I have tried a lot of cleansing wipes. I LOVE these. They really clean the face well, getting off all the makeup, every last bit. Skin is left feeling refreshed and most of all clean. Sometimes with those wipes skin doesn't feel clean. But with these it does. Even though they are for oily skin and my skin is normal, I use them. I find that they do not dry out my skin, they exfoliate more, which I actually like and my skin is not sensitive so I can stand to have that without any problems. I feel like the price might be a little high but this is a luxury brand so, the price fits in with their image. I have some other products from their line I will be reviewing soon and they are really quite good. Just as good as these cleansing wipes.